We now come to Tie Five in our ongoing Louise Page interview. The Thomas Nash tie isn’t the most popular amongst fans, but as you may have read in my blog, they seem to be the most common to come up on eBay. Worn only in The Idiot’s Lantern, she reveals the thinking behind this tie and the reason for its solo appearance, as well as giving us a background to her methodology when shopping for ties. You will have read recently that I manage to secure a VERY rare tie - the Christian Lacroix swirly tie, known as Tie Four in my Tie Index. Although I have found a differing colour way, the weave is 100% as screen used. I also own both version of the Swirly Tie made by Magnoli Clothiers, so I’m in a very good position to review both of them alongside the original I now own. But before I do so, I need to remind you of a very specific piece of background info which will explain what the ties are trying to replicate, and thus manage your expectation of how the tie should look. When Louise Page came across the Christian Lacroix tie it was a one-off – literally the last in the shop. Whereas she would usually buy three or four identical ties for stunt-doubles and allow for damages, she fell in love with it, ignoring her own golden rules and bought it anyway. 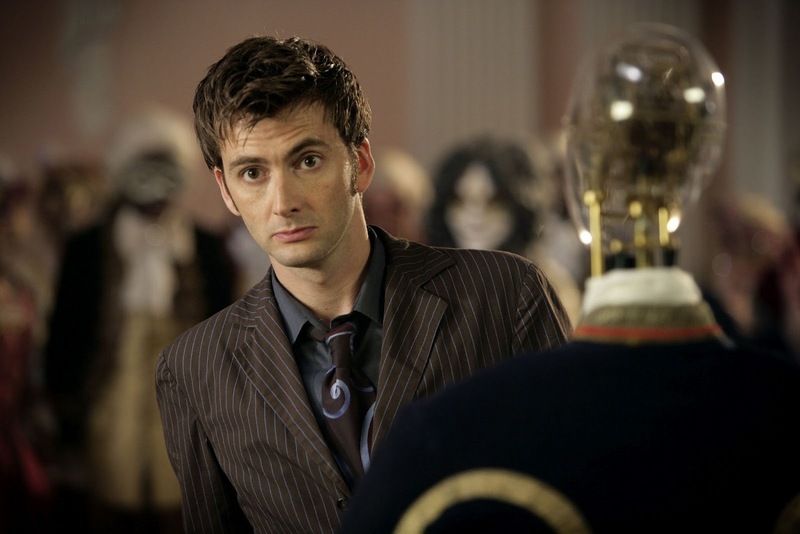 She only featured it once in an episode from beginning to end, The Girl In The Fireplace. This was because stunt-work was at a minimum during the story, so the tie could be kept ‘safe’. 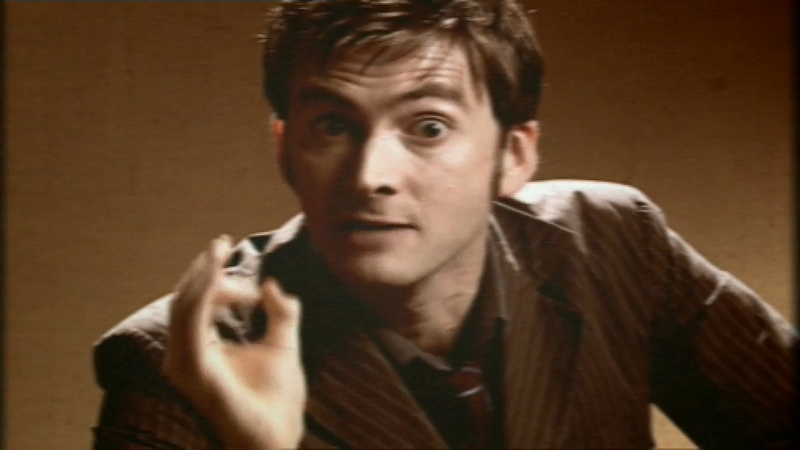 Its other appearances were deliberately brief or in self-contained scenes, such as in Love And Monsters (see left) and Blink (see below). 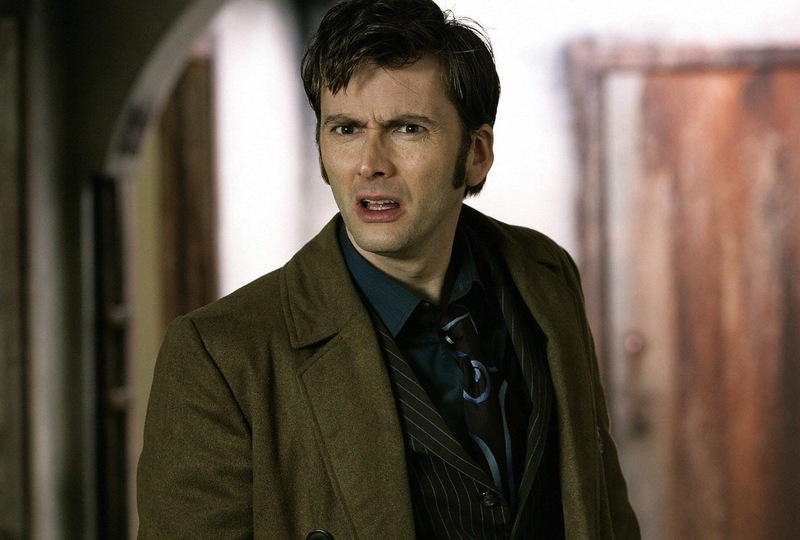 These appearances were specifically selected to limit its exposure to potential continuity issues, damage or loss in the more high octane scenes. So when it can to David’s swan song and his final scenes, she choose a tie she had extra special affection for: the Christian Lacroix. Knowing she would be handing over to a new costume department, she checked that it was okay to use the tie, bearing in mind there were no back-ups or spares. No questions were raised, so filming went ahead as planned. However, once the script came in for Matt’s debut adventure, it became apparent the tie would form part of the plot and need to be distressed, following the TARDIS crashing into Amelia Pond’s back garden, as well as being trapped in a car door! Reluctant to allow the precious, unique tie to be damaged, Ray Holman and his team had to make a replia of the tie so they were free to do what was required in the script. This was done by tracing the design onto brown silk and embroidering the blue swirls to match. A couple of reddish areas were replicated by using scraps of coloured silk appliquéd on, but these didn’t quite match the original, hence the visible difference between the two versions. Thus, there are TWO distinctively different versions of this one tie. So it now comes down to which of these ‘screen-accurate’ ties is being copied. Last time we heard from Louise Page, she told us the story of Tie Four, the popular swirly tie. 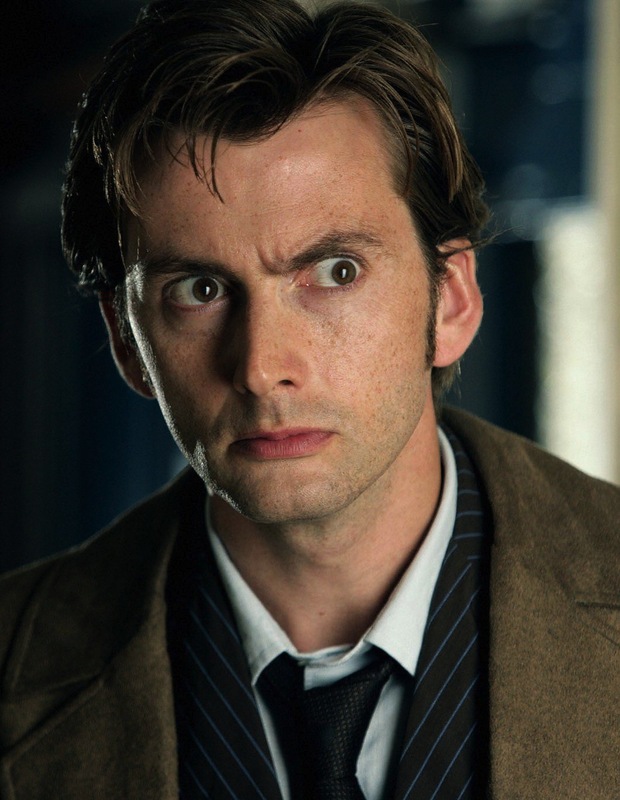 She explained how when she bought it, it was the last tie in the shop, so lacking repeats for stunt-doubles and damages, she used it sparingly during the Tennant era. 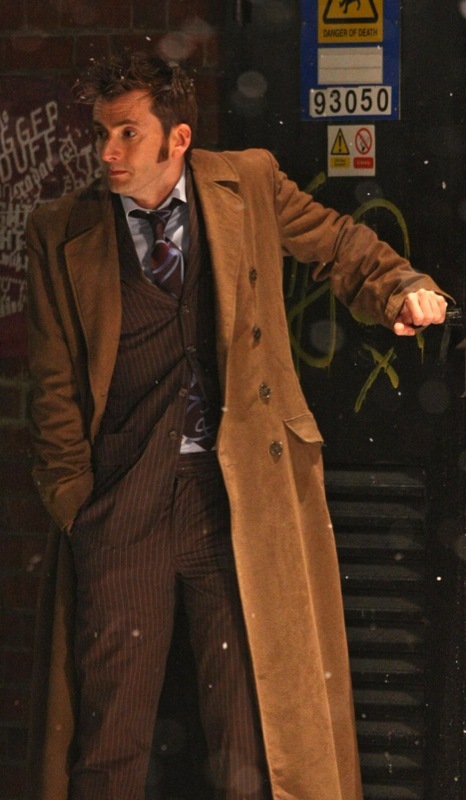 Being her (and David’s) personal favourite, it was first choice for the Tenth Doctor’s closing scenes. 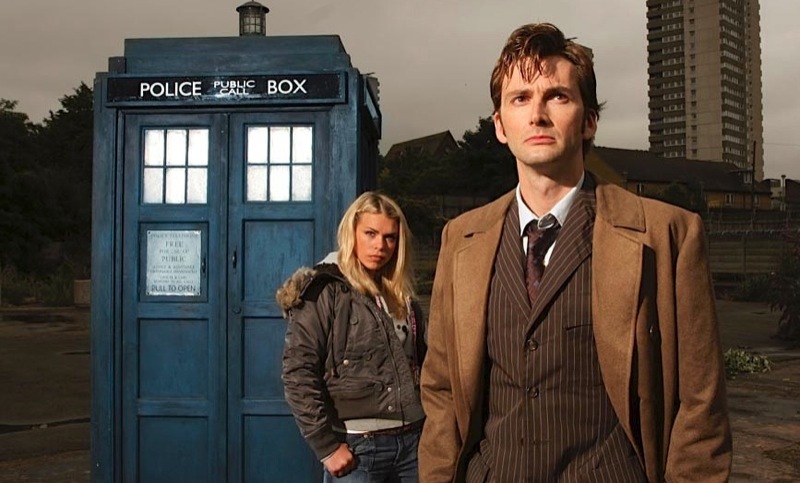 Louise now shares with us the background to the Tenth Doctor’s emotionally charged departure. Filming for The End Of Time allowed for the only opportunity for David Tennant and Matt Smith to appear together in a unique publicity photograph. When is Tie Four not Tie Four? I know a number of my readers have been waiting with bated breath to hear what Louise Page has to say about Tie Four, as it is a very popular tie - and the biggest fan of it is none other than Louise herself! 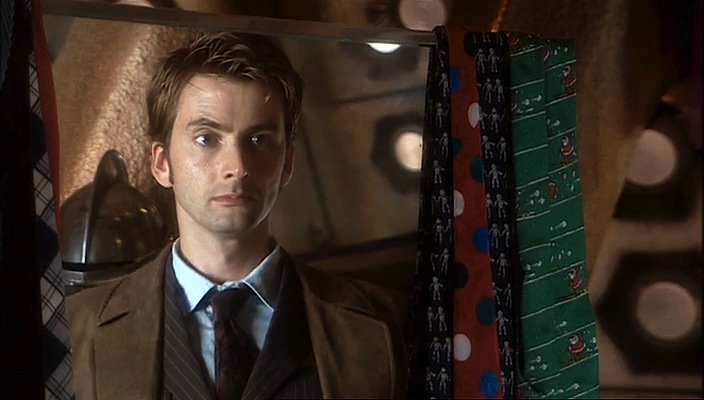 For a tie that was technically only featured in one episode, and then appeared briefly in a handful of others such as Love And Monsters, Blink and The End Of Time pt 2, it has quite a history. So much so I will be splitting this over three postings. Today we shall hear from Louise about why she had to limit its exposure, despite it being her favourite tie of all. 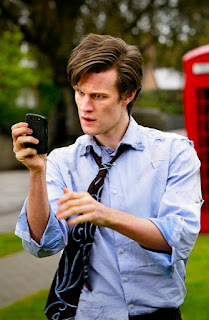 Louise will share the rest of the tie’s history in two future postings, one on here and one on my Eleventh Doctor Blog. Find out why on the 22nd February. 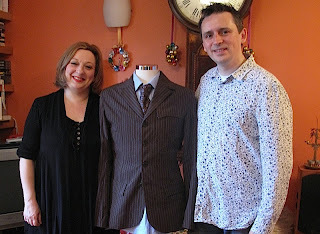 Over the past week or so we have been hearing from costume designer Louise Page, who has kindly been sharing her memories of the Tenth Doctor’s ties. Before she talks about Tie Four - her personal favourite - I’ve got to share with you a recent eBay find. 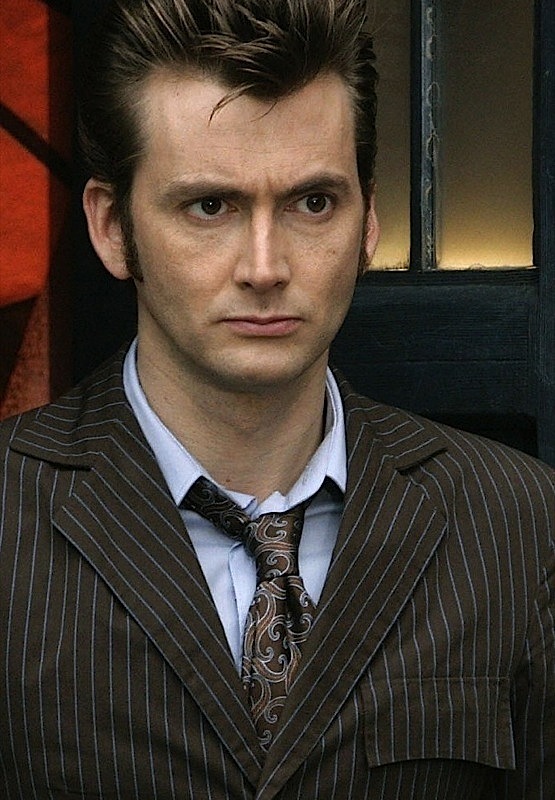 Tie four is one of the rarest worn by David Tennant as the Tenth Doctor. Commonly referred to as the Swirly Tie, it is actually a tie by high-end French fashion house Christian Lacroix. As you will soon hear from Louise, when she found it at London’s Selfridges, it was the only one available. Usually she would buy three or four repeats so she had spares for stunt-doubles, stand-ins and damages, but she made an exception with this one because she fell in love with it at first sight. Later this did cause production problems, but that’s a whole other story for another day. So it’s a bit of a red-letter day when an original Christian Lacroix tie, abet in a colour way variation, turns up on eBay! So far Louise Page has told us about two of the Tenth Doctor’s ties: the popular Daniel Hechter tie; and the one-off vintage worn in The Christmas Invasion. The next tie in the Tie Index was another that made only one appearance. School Reunion had one of the most sombre ties worn by the Tenth Doctor. The next tie Louise will recall is the much envied Tie Four. Check back real soon, as I have a major scoop to reveal . . . .
A few days ago Louise Page told us the story behind the Tie One, and how it was an eleventh hour after thought. 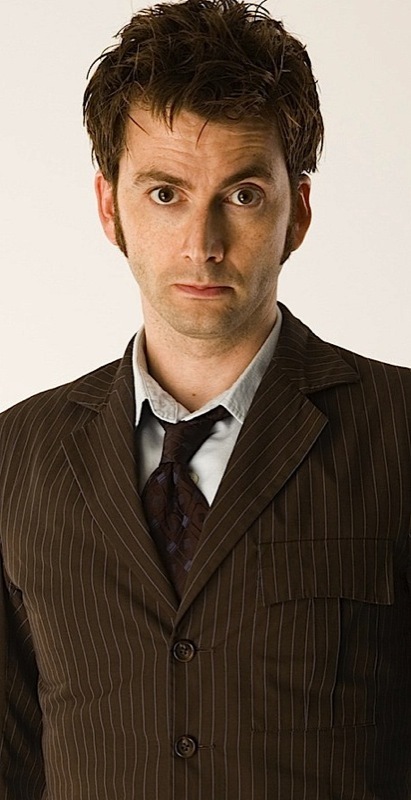 Today she will tell us about Tie Two, one of the more popular ties the Tenth Doctor wore. One of these ties (along with three others) sold at Bonhams for over £1,600. This sale revealed the label to be Daniel Hechter. It was used a lot early during publicity photo-shoots, but its debut appearance was in the RedButton adventure Attack Of The Graske. 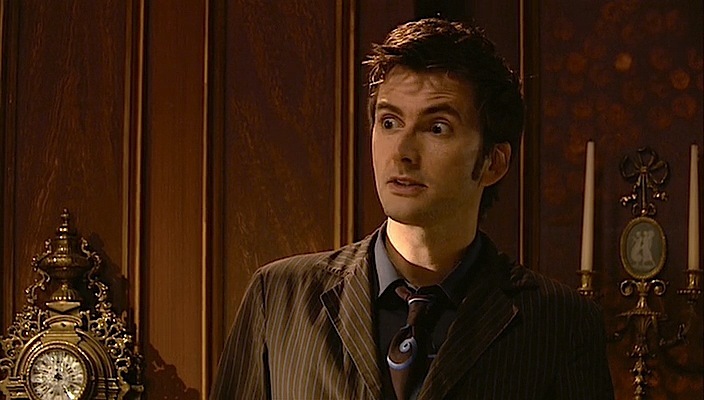 The tie was then a regular, cropping up in New Earth, Rise Of The Cybermen, The Age Of Steel, Doomsday, The Runaway Bride, Partners In Crime, The Unicorn and the Wasp, The End Of Time Pt 1 and The End Of Time pt 2. 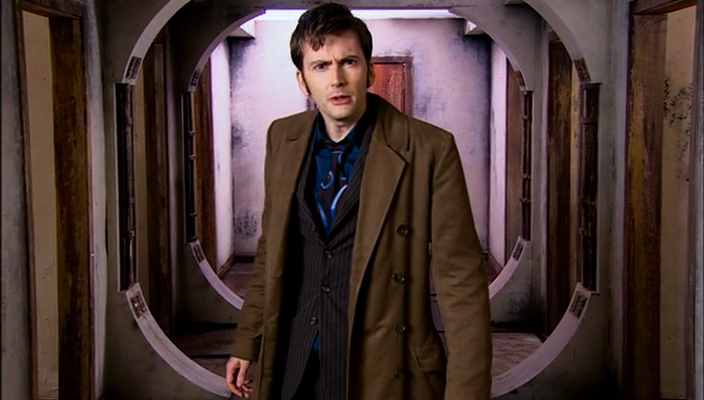 With no less than ten episode appearances, it is a very familiar design with fans. It’s also been the most copied, with Magnoli Clothiers doing three versions to date. 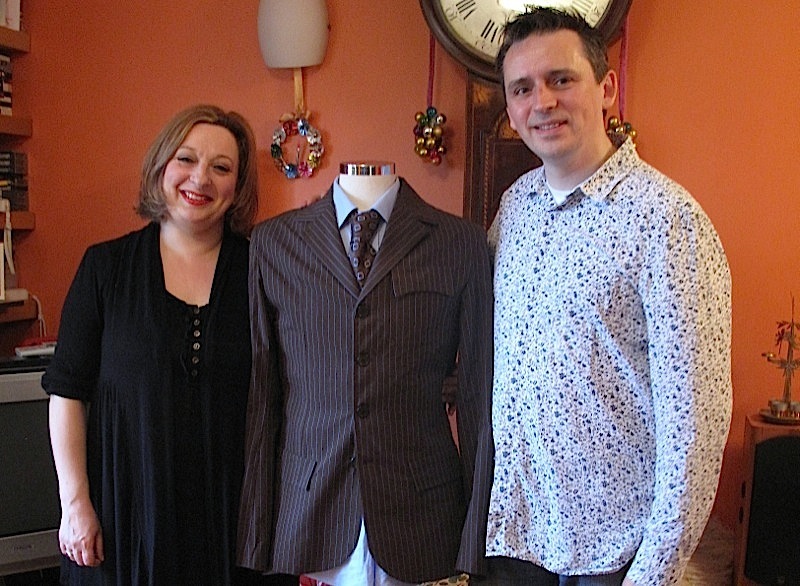 Louise explained to me the story behind the tie, and the unusual pet name she gave it! Check back soon to hear about the next tie, Tie Three, and why it only appeared once, in School Reunion. 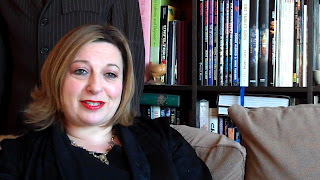 As you will have seen, costume designer Louise Page recently visited me again so that we could do a proper on-camera interview for my blogs, and today I have the first of the clips I will be posting over the coming weeks. My most popular entry in this blog is by far my Tie Index, so I had to ask her about these for my readers. The first tie David is seen wearing is a bit of an odd-ball. It only appears in the closing scenes of The Christmas Invasion, and has never been correctly identified. As I found out from Louise, there is a reason for this . . . Check back real soon to hear Louise’s thoughts on Tie Two, the Daniel Hechter tie, or as she calls it, the Doll Tie!